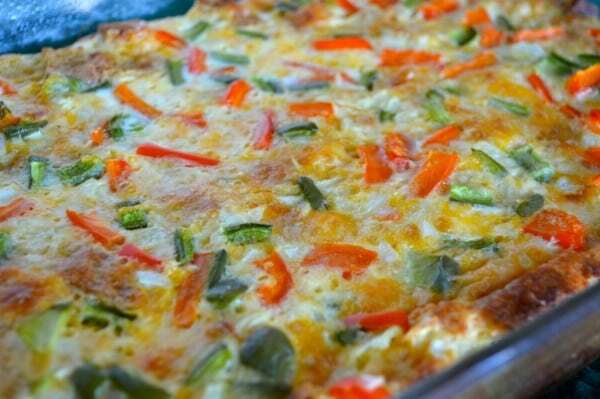 It’s Day 19 of our Home for the Holidays … Gluten-Free Style and Heather (Gluten-Free Cat) shared her Christmas Breakfast Casserole. She’s transformed a family favorite into a gluten-free, vegetarian dish, which is “just a tad healthier” by using colorful vegetables instead of meat. I also expect that Heather’s version is prettier (and more than a tad in this case) than the original. Heather is another wonderful blogger friend who I finally got to meet in person at the Gluten-Free and Allergen-Free Expo this past May. There’s nothing quite like meeting a virtual acquaintance, specifically a fellow blogger, in real life. The face-to-face time helps seal that tentative bond, but best of all, the next time you’re reading the individual’s blog, you are actually “seeing” and “hearing” him/her in your mind. I was even thinking of Heather today when I picked up a book on raw foods (Raw Foods Made Easy for 1 or 2 people) when shopping with a friend. That’s because I follow Heather’s blog and she has been enjoying venturing into the raw food arena for several months now. She’s been dining at restaurants with raw options (e.g., Pure Food and Wine, Candle 79) and participating in raw potlucks (General, Asian, Mexican, Italian). She’s shared many amazing looking recipes for months now. Back to our meeting for a moment …. not only did I get to meet Heather who is super sweet—and much taller and prettier than one can see in her avatar—but I also got to meet her very lovely mom. In her post today, Heather talked quite a bit about her mom and one of her mother’s other very special contributions to Christmas. You’ll want to check it all out here. Plus, Heather has a giveaway of three items (meaning three winners) for you! 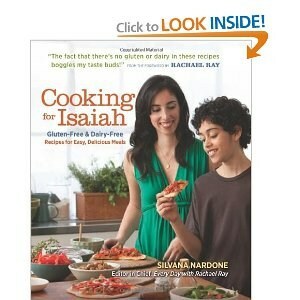 Cooking for Isaiah ~ This book is Silvana Nardone’s very popular gluten-free, dairy-free cookbook, which I reviewed here. 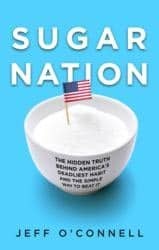 Sugar Nation ~ Jeff O’Connell’s look into the effects of the sugar (and other foods that convert to sugar, like potatoes and other carbs) that seems to be omnipresent in processed foods and meals today. Using his own personal story and all the data he gathered to investigate his own path to health, O’Connell reveals why current medical guidance is flawed. 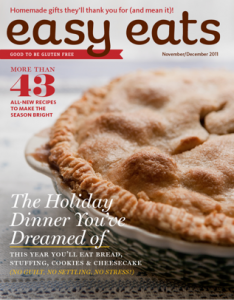 Easy Eats ~ Easy Eats, an all-digital food and lifestyle gluten-free magazine, has quickly become a favorite of the gluten-free community. One reader will win a one-year subscription! As always, please remember that all entries qualify you for special giveaways as well as the final giveaways (Caveman Cookie gift packages of $89 vaue; Free From Gluten $150 shopping spree, and a Vitamix—the 5200 Super Healthy Lifestyle package of $550 value). I’m doing a special giveaway for all entries throughout our entire event through midnight tomorrow night. The winner will receive a copy of Katie Chalmers’ terrific book, Mommy, What Is Celiac? and one cupcake holder (one of these). Note that Katie currently has a 30% off special for her books on her website. You can order here. Yesterday, Silvana (Silvana’s Kitchen and Easy Eats) shared her Italian Pine Nut Cookies, also known as pignolis. 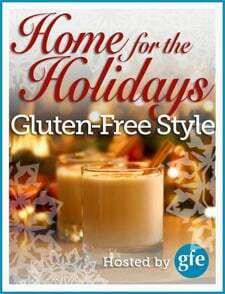 Tomorrow we’ll have Carol (Simply … Gluten-Free) sharing her special holiday recipe with another giveaway. Until then, please check out Heather’s make-ahead, gluten-free vegetarian Christmas Breakfast Casserole and enter her giveaway here. « Home for the Holidays: Silvana of Silvana’s Kitchen (and Easy Eats) with Pine Nut Cookies & Giveaways! Hi S. Angell–Welcome to our holiday event! Each blogger decides on different ways to enter for their day, but leaving a comment is always one of the entries. Here’s a “cut and paste” of the instructions from my Day 1 post on Nutmeg Shortbread Flats giving the info for mine. Thanks for all the great tips—newly diagnosed and making the transition so you and others with more experience are great resources. Hi Janis–Thanks so much! 🙂 Remember that all entries for this giveaway must be made over at Heather’s blog. Good luck! thanks for another great giveaway and recipe! Day 19 and going strong Shirley! Great job!!! Looks delightful. Thanks for introducing us to all of these great bloggers! As someone who always struggles with healthy breakfast and lunch ideas, I’m excited to see this recipe! I’m enjoying getting to “know” all the bloggers and am really enjoying learning to cook all over again. Thanks!